Copper River Wild Alaskan Smoked Sockeye Salmon - Savor the well-rounded flavor of Copper River legendary Sockeye salmon...the filet mignon of smoked salmon. Wild caught, renewable, sustainable...slow smoked salmon. Considered the highest quality wild Alaskan smoked Sockeye salmon in the world, this award-winning Copper River Sockeye salmon is all natural & alder-smoked to perfection. Our selection of Wild Alaskan Smoked Sockeye Salmon is a perfect appetizer, hors d'oeuvre with crackers, or hostess gift. Tasting is Believing..."it's not about being the biggest fish, it's about being the best fish!" 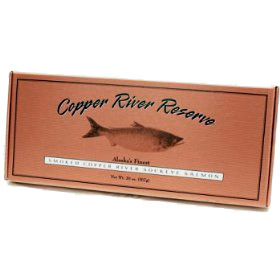 Smoked Copper River Reserve Wild Alaskan Sockeye Salmon Fillet (20 oz.). 20 oz. fillet, vacuum-sealed package.